It had been a while since I’ve stopped over to Zingerman’s Deli, the large crowds and higher priced sandwiches only encourage a splurge from me a couple of times a year. My husband and I had some business in Kerrytown this past Saturday and I decided that I was craving a bit of Zingerman’s barbecue. At noon on Saturday the line was out the door and around the corner as expected, but we made sure to arrive when we were right on the edge of hungry, rather than in starving mode. We chatted with a young woman who was new to town, which also helped pass the time as we waited in line for about half an hour to place our order. In the past, I’ve almost always gotten the Detroit Street Barbecue Chicken sandwich, which is fantastic, but this time it was Lisa C.’s Boisterous Brisket that was calling my name and it still comes with a side of their awesome applewood-smoked bacon baked beans! Zingerman’s offers two styles of pickles, new and old. The new style is more “cucumbery” and the old style has a more garlicky flavor. Both are good, but I went with the new style for this visit. It was a gorgeous day, but their were still several open tables outside, even having waited in line, but we opted to sit inside in the air conditioning over at Zingerman’s Next Door. We easily found a two-seater table inside while we waited for the staff to call our names and bring over our sandwiches. While we waited I took a peak at the desserts in the case so I could decide on something to take home afterward. Our sandwiches arrived about 20 minutes after we sat down, the amount of time we were quoted when we paid for our order. The smell alone is amazing, but the sandwiches were truly sensational. 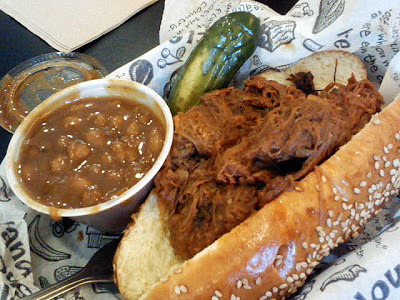 The Nosher (smaller-size) barbecue brisket sandwiches are one of the best values on the Zingerman’s Deli menu. It’s still plenty of food for a good appetite, but they’ll only run you $8.50 each and that includes the side of beans and your choice of pickle. The hoagie bun for the beef brisket sandwich is nice and soft and coated with sesame seeds. The brisket is overflowing from the bun and has just the right amount of their own sweet barbecue sauce to make the sandwich really come together. I wish Zingerman’s made the hamburger buns they sell to Great Plains Burger Company the same way as their hoagie buns, because it’s the perfect texture (I know, enough with the hamburger buns complaints already!). The side of applewood-smoked beans have a great smoky flavor and a nice complexity. The new style pickle with the great cucumber flavor is a nice change from the traditional style pickle. I took home a slice of Zingerman’s Buttermilk Cake. It’s described on their website as “A dense buttery yellow cake filled with raspberry buttercream and covered in smooth vanilla swiss buttercream.” Being a yellow cake and raspberry lover this one really caught my eye. The woman at the register said that the staff had a sampling from the very cake my slice was coming from earlier that morning and it was the best version of this cake she’s every tasted. Well, not having this cake before, I can’t add my own testament to that, but it really was delicious! I split it into two servings so that I could enjoy it an extra day, but also to minimize the damage to my arteries. Even Paula Deen would cringe at the amount of butter used in this cake. The texture of the cake was luscious and light, the raspberry flavor from the filling was really good and the rich (very, very rich!) 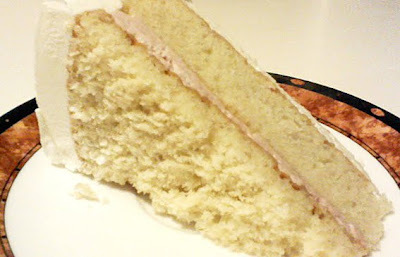 vanilla buttercream on the exterior was smooth and full of butter flavor. Oh, so good! At $6 a slice, some might find it a bit pricey, but you can really taste the quality of the ingredients in this dessert. Also, consider what you pay in a sit down restaurant for some of your desserts that aren’t nearly as good and you’ll start to see that it’s really reasonable for what you get. Sometimes I take Zingerman’s for granted since it’s so close to where I live, but I may have to start making a few extra splurges each year. They really do have the best customer service in town and they really care about the quality of the ingredients they use in every last bite of any product you order. It’s really nice to see this type of pride in a business and I hope it continues for a long time to come!